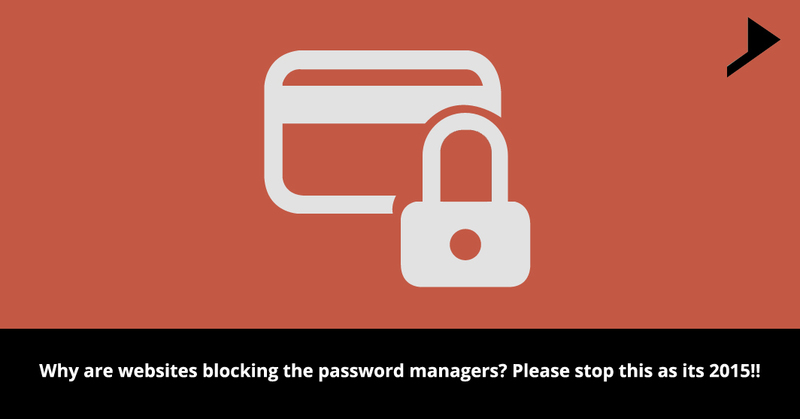 Home / Client communication / Why are websites blocking the password managers? Please stop this as its 2015!! I hope everyone is aware of the fact that passwords play a very vital role for security reasons. It should always be strong and unique. But I am afraid to inform you that there are some websites which intentionally disable the feature which allows us to use solid passwords easily. The real problem is that some of the sites do not allow you to paste the passwords into the login screens instead of which you are asked to type your passwords. Hence the use of password managers becomes impossible. The function of a password manager is to generate and store a lengthy, complex and exclusive password on a remote server or either on your computer. You can remember one password and use it for all other accounts which definitely will reduce the task of memorizing loads of passwords. There are some of the organizations having a false belief that interrupting password managers will be helpful in improving the working situation around. Different complaints related to the issue of not being able to copy paste the passwords have been notified. To my surprise PayPal users were also facing a similar problem last month when they tried to change their password. So it’s a big question that why are companies stopping the users from copying and pasting their passwords. Many of the higher authorities have a wrong confidence that disabling the function will be a recognized way to avoid some forms of malware as they feel that customer’s security is their top priority even if this causes inconvenience to the user. It is a way to prevent phishing of passwords and physical force attacks. The most hazardous factor of this wrong belief is that when the password managers are locked the users may just enter in a garbage which was previously memorized. This creates a problem because reused passwords often leads to compromising of accounts. An example of the same can be of Uber accounts which were found on dark web for sale. They were hacked as the users used the same password on other services also. Starbucks had to face an issue of accounts getting drained of the finances. Managers can avoid these restrictions through some of the technical work around to paste passwords onto sites. Non-technical people do not usually use password managers. In this world of enhanced technology where our routine is played out online sometimes under a single protection of a password its terrific when some of the sites stop us from being as secure as possible. The main aim of the companies should not be just to embrace the password managers but it should be actually to encourage their use.